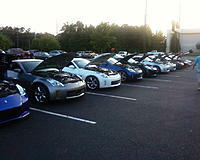 For those who feel the 370Z doesn't have enough performance, Nissan has created the Nismo 370Z. You can liken the car, which bears the name of Nissan's Motorsports arm (Nismo), to a tuner version of the popular sports coupe, but all the tweaks were made in-house. The car was developed by Nismo and the company's conversion specialist, Autech, in Japan. It's immediately clear — this isn't your ordinary 370Z. The wild body kit includes an extended nose, new side sills and flashy rear spoiler. There are also shapely new front fenders that are reminiscent of a European supercar. Nissan claims that all the body pieces are functional, providing extra downforce at high speed. Inside the cockpit, Nismo logos on the seats and instruments tell you that this isn't your everyday 370Z. Under the hood, Nismo breathed an extra 18 bhp into the 3.7-liter V-6, so now it pumps out 350 at 7400 rpm and 276 lb.-ft. of torque at 5200. With the added power, and no weight gain, the Nismo 370Z will be quicker than the stock car in a straight line. We expect 0 to 60 mph times of 4.5 seconds. The car's handling has been improved, too, via stiffer suspension. Compared to the standard setup, front spring rates have been dialed up 15 percent, and rear spring rates increased 10 percent. There are also fatter anti-roll bars at both ends. Overall, roll stiffness has been increased by 15 percent, says Nissan, and the front and rear damping factors have been increased by 40 percent and 140 percent respectively. Although the ride quality will be harsher, the Nismo Z will undoubtedly take corners better and be faster around a racetrack. The Nismo 370Z will be sold at Nissan dealerships starting in June. Although prices have not yet been announced, we're expecting something in the neighborhood of $37,000. Sounds and looks good. Cant wait to see how it does.